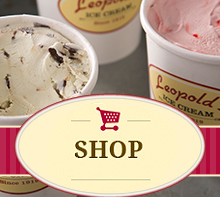 Stratton Leopold, owner and operator of Leopold’s Ice Cream, is the youngest son of original founder Peter Leopold. He was born and raised in Savannah and grew up in the ice cream business under the guidance of his father and uncles, but his sights were set on something else entirely – Hollywood! Stratton began his young adult life as a Pre-Med student at Georgia Tech and Vanderbilt Universities, but ultimately chose to follow his dreams and work his way into the film industry. During his early career he filled smaller behind-the-scenes roles like location manager (The Big Chill) and casting director (Wise Blood). You can even catch sight of Stratton acting in a few films – watch out for him pleasantly chatting with a zombie-like alien in John Carpenter’s They Live! In time he rose through the ranks and became a full-on producer and Vice President of Production at Paramount Pictures. His production career has been long and successful; his projects have included The Adventures of Baron Munchausen, Mission: Impossible III, and the recent adaptation of The Wolfman starring Benicio del Toro and Anthony Hopkins. Stratton still produces movies, but his heart is where it was from the beginning – in Leopold’s Ice Cream. See Stratton’s IMDB page for full details on his film career.